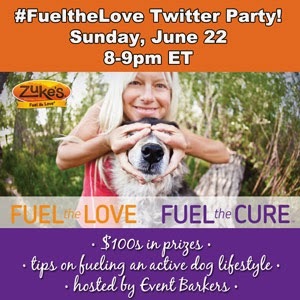 To Dog With Love: Jump at a Chance to Win $100s in Zuke's Prizes at #FueltheLove Twitter Party! Jump at a Chance to Win $100s in Zuke's Prizes at #FueltheLove Twitter Party! Rocco jumps for Zuke's treats! Earlier this week, we announced the upcoming Zuke's #FueltheLove Twitter party, slated for June 22 from 8 - 9 p.m. ET. Not only does it support a great cause -- The Dog and Cat Cancer Fund -- there's also loads of fun and great prizes on tap! Head over to our RSVP post to find out three ways you can win (each pre-party prize valued at $70) even before the party starts! Then, take a look at these fabulous prize packages from Zuke's! If you're like us, you believe you never can have too many Zuke's treats in your pantry! Nine prizes valued at $70! Three winners will be drawn at random from the pre-party entries, and six more winners will be drawn at random just for Tweeting with the #FueltheLove hashtag during the 6/22 Twitter Party! 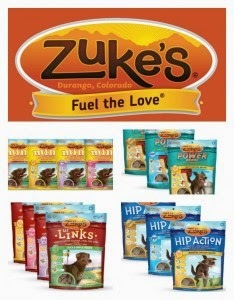 A total of nine bags of Zuke's treats in a variety of yummy flavors! One Grand Prize valued at $120! Yum! That's a whole lot of tasty treats to help your pup #FueltheLove! In all, we'll be giving away $750 in prizes as well as helping raise $ for The Dog and Cat Cancer Fund simply by posting photos or videos of pups having fun and loving life! We'll also be sharing tips on staying active with your pups so you can #FueltheLove for a long, long time! We're looking forward to hearing your tips and activity suggestions, too! Hope to see you on Twitter on June 22! Now, go enter some of those pre-party prizes! What are you waiting for?!! I'll just say PAWsome photo! Thank you! Rocco loves to fly! Wheeee! We agree, great shot. Have a tremendous Thursday. Sounds fun! Lots of goodies too! Awesome shot! We will be there! Yay! We look forward to "seeing" you!